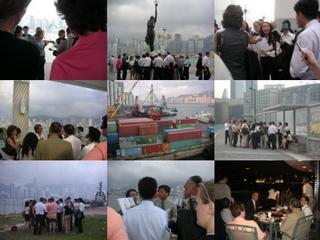 Over 35 participants took part at our second Harbour Walk from TST to Hunghom. We learned the history of the Kowloon waterfront, existing arrangements of management (public and private) for the promenade, current beautification projects, KCRC hopes for a major upgrading of their waterfront land and opportunities at Hunghom waterfront. The participants were rewarded at the end with a pleasant evening of drinks and snacks at Hong Kong Harbour Plaza's Waterfront Terrace.